It is the 28th of August and I have 19 watercolor drawing collages complete. I just finished two today. My spirit animal of the week is a red lizard. Very appropriate. I see dozens of lizards every day in New Mexico’s high desert. Curiously, the lizard helps us see the importance of respecting and remembering our dreams. I am not sure how I feel about that given the dreams I had this week. Lizards also aid us in becoming more detached from situations in your life. This I certainly need as I have had three months of crushing grief from the co-op board of my NYC apartment. 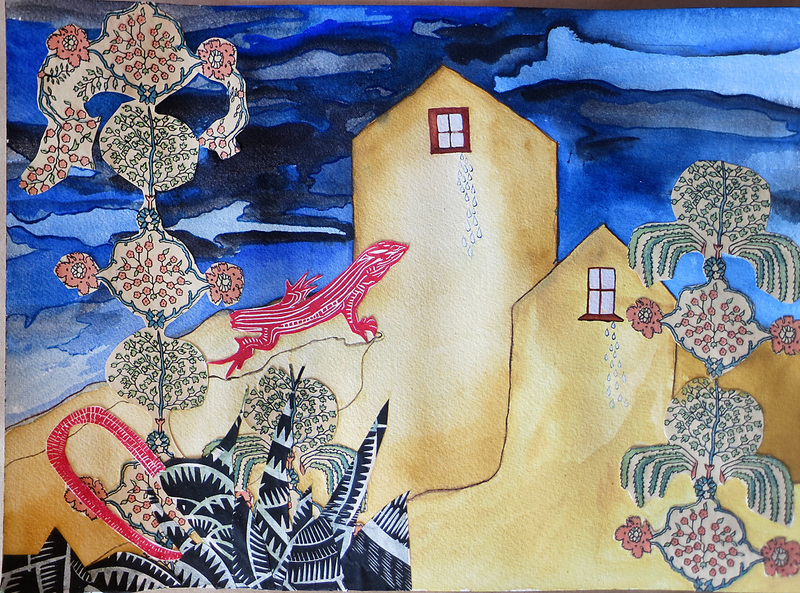 As I finished the lizard drawing today, the crying house, the lizard losing it tail, I had to laugh at the simplicity of it all. This Lizard is said to be telling me to move on and quit being attached to what has been. Lizard is proposing immediate change in one or more areas of my life. So, that must mean only one thing. 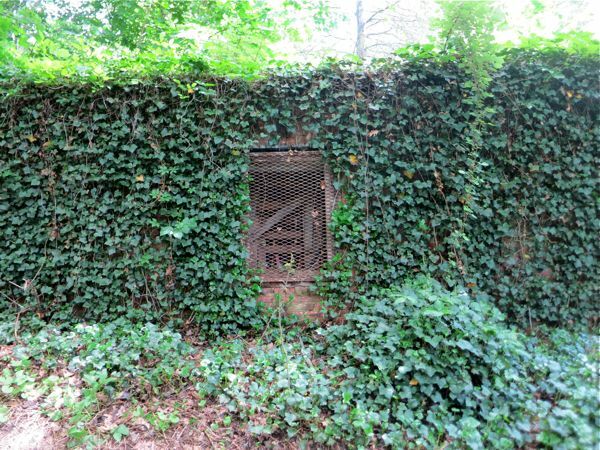 I have an apartment for sale! So long Rivington Street and Lower East Side and good riddance to the noise and the sad souls of the building, though the good souls I will miss! This someone has something far more wonderful happening and a big bright wonderful world to step out into! Just follow the lizard! Who can resist a red lizard that just shed it’s tail? 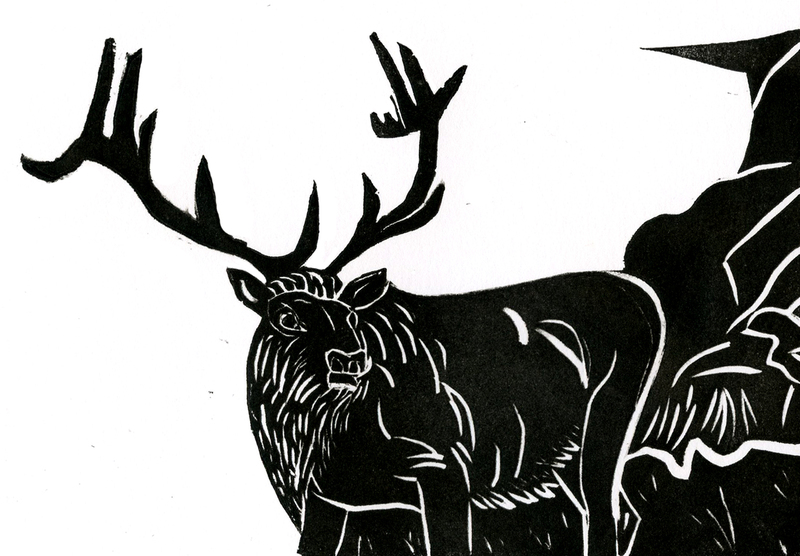 Printmaking Workshops, Next One August 30. To give my studio life a bit of variety and to make a bit of cash, I have been teaching one day printmaking workshops. 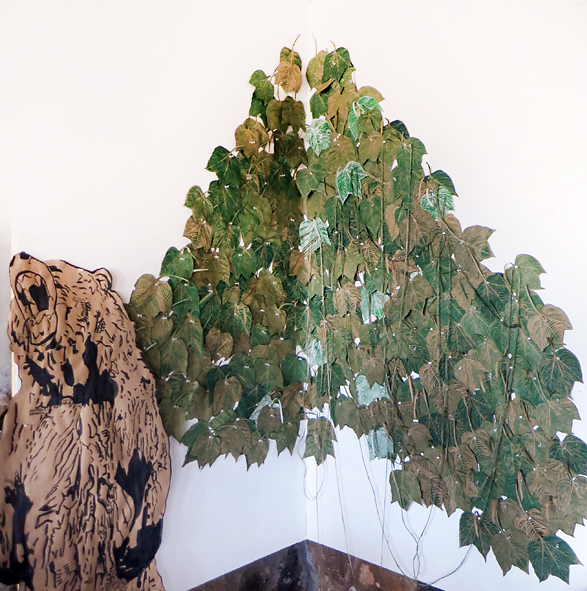 I started these in my home in NYC, where 2-3 people come over, and I teach them to draw, carve and print an edition. It has been a blast. 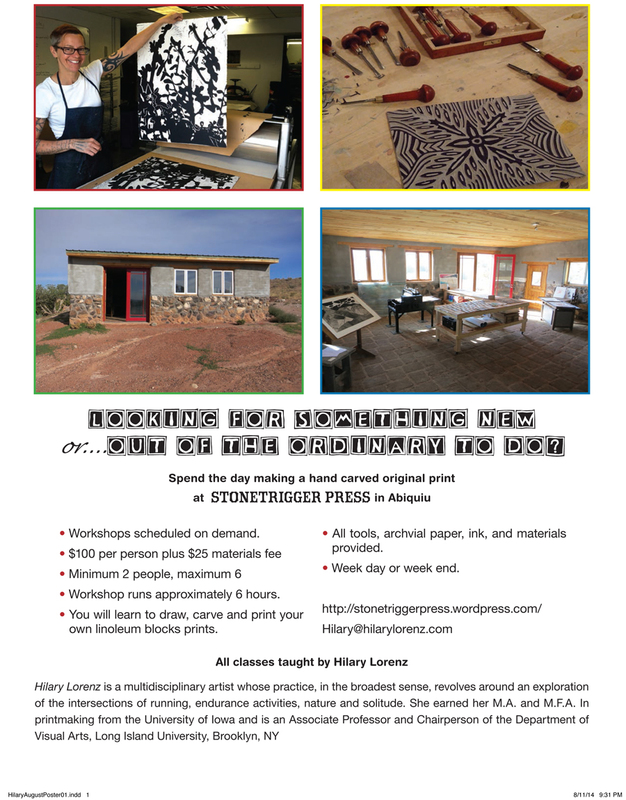 Now I am offering one day workshops in my very own Abiquiu, NM printmaking studio. Just $100 for the day, plus $25 for materials and each person walks out with an edition of at least 10 prints. Prior to the workshop each person will receive a 34 page booklet of helpful tips. No matter what the person’s experience is, it always take just about 6 hours. So if you want to join us on Saturday August 30, confirm with me now, as I limit it to 5 people. If you and a friend want to come another day, just let me know. The very last day I can offer a workshop before I leave for my exhibitions is Friday September 26th. So get yours now! I had a great weekend of running up Wheeler Peak in Northern New Mexico, a 16 mile round trip from 9400 ft of altitude to 13,100.’ After being pelted with hail, sleeting rain, freezing winds and having to outrun thunder and lightning, I took my Monday morning aching quads to the printshop. Fitting of yesterday’s run the Elk is my spirit animal of the week. The elk is associated with nobility, perseverance, endurance, relationships with others, stamina, strength, agility and pacing. I used all of these traits in yesterday’s run and called them up again this morning to draw, carve and hand print this weeks Spirit Animal Edition. I do this one day a week, each week, usually on Monday. Check back often as you animal may just show up next! To read more about the Elk Spirit Animal and or to purchase one of these $40 prints, just click here. There may be a peacock or two left from last week. I will add one animal a week to this collection. Today was a great day in the studio. I got a new watercolor collage done. It was a blast working on it. This series of drawings started when a colleague gave me dozen’s of sheets of Italian printed paper that her mother collected in the early 1950’s. The same week a friend gave me a roll of linoleum. The only thing I knew was that I was going to use both materials to make my new work. Within a week I had stumbled onto a horoscope website. I am not one to read my horoscope or honestly believe it, but this one is fun. Susyn Blair-Hunt, sends you daily horoscopes with a weekly affirmation and spirit animal. I made it my practice to carve the animal I, a Libra, was given each Monday morning. These linoleum block printed animals have turned into a nice series, a series which will be available on myEtsy shop beginning Friday, August 15th. 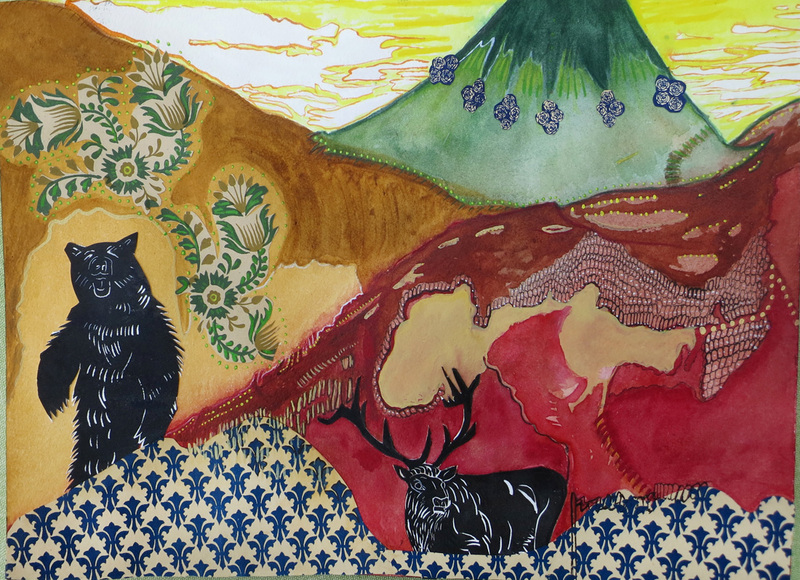 They have also become cut-outs that I weave into my watercolors making up little fantasy stories. 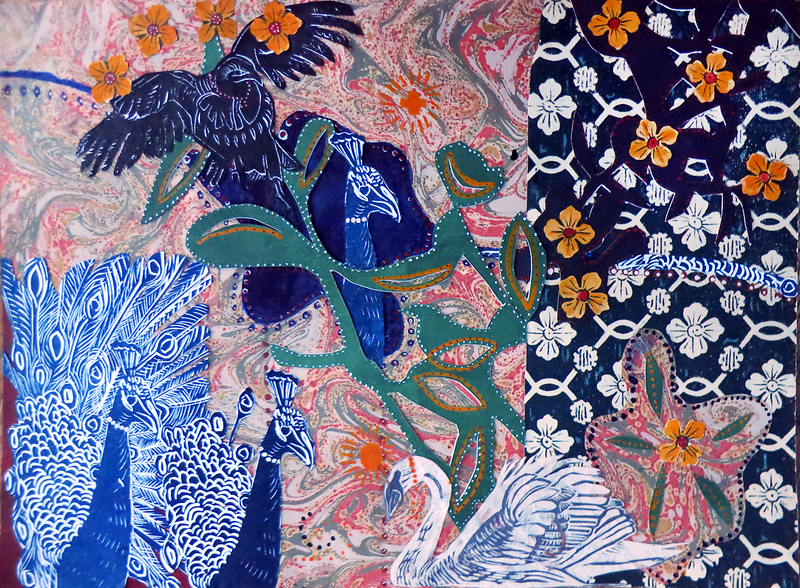 This one containing, peacocks, a swan, and a hawk, all animals that lead me over the past three weeks. What does each one stand for? Well I will let you look that up, or check out myEtsy site on Friday, where each lino block 8″ x 10″ print will be available, and the link will be on my front page. Until then, here is my new watercolor drawing. Welcome to my new website. With loads of new drawings, prints, and upcoming events, it is time for an update. I will post weekly with new artwork and the latest in adventures. For today, here is my Roaring Bear Spirit Animal. 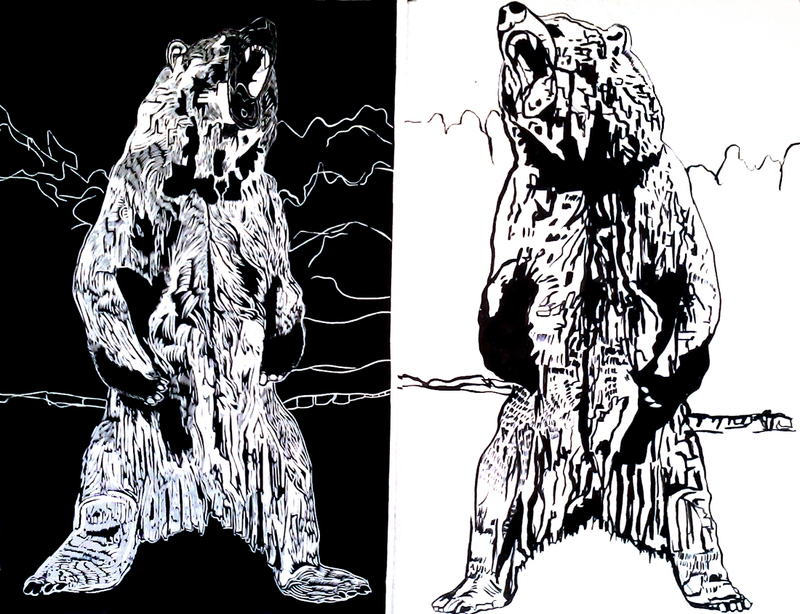 One the left is a linoleum block print, 36″ x 24″ and on the right is an original ink drawing, which is just slightly taller at 40″. The prints are in an edition of 20, hand printed on Revere paper and available for $475. Please use my contact page for more details.